Downtown Grand Rapids offers some incredible condos from cool, affordable urban studios at the Hillmount or the Boardwalk condos, to luxurious penthouses and lofts at Riverhouse condos or the Fitzgerald Condos. One of the problems we have been experiencing with buyers wanting to purchase a downtown Grand Rapids condo has been financing. Many of the condos, especially the “boutique” condos like Peck, Front Row, Cityview or 65 Monroe require a conventional mortgage with ten to twenty percent down. It can be difficult to come up with that amount of cash on hand. Having said that, there are some condos that are FHA approved. This is important to many buyers, especially first time condo buyers looking to capitalize on the $8000 Tax credit. With an FHA loan, you need only pay a 3.5% downpayment on the loan. Much better than 10% or 20%! Boardwalk condos are FHA approved! Just before last Christmas they were approved. Boardwalk is a great building with many amenities including a pool hot tub area, game room, theatre room, fitness center, roof top deck, salon and JD Reardon’s bar. These condos are loft style with exposed brick, exposed duct work, river views and tall ceilings. Many floor plans are available from studio, 1, 2 and 3 bedrooms and there are two courtyards, one with the pool and the other with a peaceful, wooded area where the outdoor grills are located. The Hillmount condos are FHA approved! The Hillmount condos offer a little different feel to the Boardwalk. The building itself is an older, solid brick buillding and it does offer a few amenities such as wireless (wifi) internet, fitness center and an awesome rooftop deck with grill. Many of these condos offer lovely hardwood floors and updated kitchens with stainless steel appliances. This is a great building located at the corner of College and cherry, minutes from the downtown core. Pets are allowed. Union Square condos are FHA approved! Union Square is one of the coolest buildings in town. You have probably seen it while driving on the expressway at the junction of I-96 and US-131 highways. The building is the Union Square High School and there is a big mix of condos here from affordable 1, 2 and 3 bedrooms which also includes some incredible penthouse units. Amenites include a very nice fitness center and the roof top deck, pool and hot tub. These condos are loft style similar to Boardwalk but with more floor plans and larger windows. Some of the old school features like chalk boards and lockers have been blended in with the modern condo features. Fulton Street Flats are FHA approved! This is a new addition to the downtown condo scene and has just been approved. These are affordable 1 and 2 bedroom condos with some nice standard features accross the street from Davenport University and minutes to the downtown core. Some features include large balconies, hardwood floors and granite counters. I like the location here and for the money, you get a good sized condo with reasonable association fees, parking and laundry rooms in each unit. For more information on any of these Grand Rapids downtown condos, visit my website or contact me any time. Work Downtown and Live Downtown at the Hillmount Condos. This upgraded, large 1 bedroom – 1 bath corner unit has undergone extensive remodeling and is as good as new. Walls have been removed to open up the kitchen and it really works well in this downtown Grand Rapids Condo. The kitchen/dining/living area flow together to create a wonderful space to live and entertain. Some of the upgraded features include Maple Cabinets, Hardwood Floors, Stainless Steel Appliances, Bathroom Tile and a huge bedroom with dual closets. Hillmount Condos are located at the corner of Cherry St and College at 505 Cherry St SE. These condos feature one of the coolest rooftop decks in town, a well equipped fitness room, wireless internet and is located 15 minutes from all of the excitement of downtown. Hillmount is also close to St Marys Hospital and has off street parking and secure entry. Take advantage of historically low interest rates and the $8000 Federal Tax to own this condo today. Use the $8000 towards your downpayment. Hillmount condos were originally apartments and were constructed in 1959. These condos were carefully restored by into cool Art-Deco/Moderne style downtown Grand Rapids residences. The building itself is solidly built with very little-to zero noise transfer between walls and floors. Air conditioning is provided by a window A/C unit or an interior A/C unit. This particular unit was originally finished last year and only very briefly lived in. It’s better than new. If you are looking for Heritage Hill real estate, homes or condos, visit me at GRRealEstateInfo.com or contact me any time. Click here to view the Online Flyer. Hillmount Condos are located at 505 Cherry St at the corner of College in the Grand Rapids Heritage Hill Historic District. These are newer condo conversions in a dark red brick building and they are ~90% sold out at this point. Hillmount condos were originally apartments and were constructed in 1959. These condos were carefully restored by CWD Real Estate into cool Art-Deco/Moderne style downtown Grand Rapids residences. The building itself is solidly built with very little-to zero noise transfer between walls and floors. There is no central air though so you will need to purchase either a window A/C unit or an interior A/C unit. 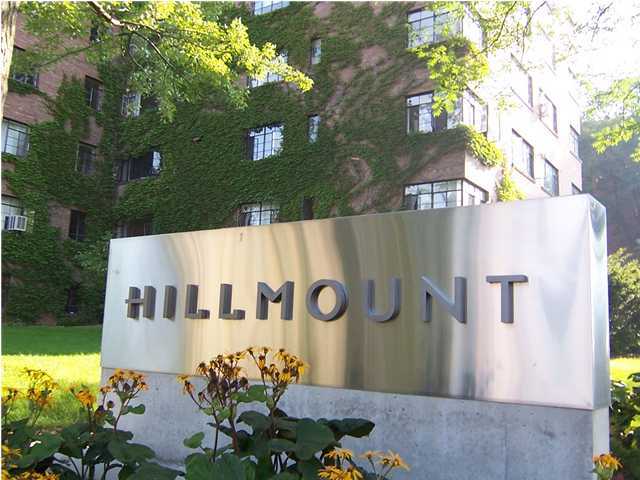 Hillmount Condos offer many lovely upgraded finishes that you would expect to find in a much higher priced unit. Solid surface counter tops, gorgeous maple and cherry cabinetry, bamboo floors and stainless steel appliances are just a few. Individual Hillmount condo amenities include washer/dryer units and the common areas contain a laundromat and a good-sized fitness center with machines and free weights. There is a huge roof-top deck with great views, picnic tables and chairs and a gas grill. Room sizes vary and do floor plans but there are studio, 1 and 2 bedroom condos available. Finished, upgraded 1 bedroom condos of about ~700 square feet are priced at ~$120k with the 2 bedroom condos in the $160 – $180k range. The smaller units make for very affordable condos and would make a great investment or 2nd home purchase. It’s about a 15 minute walk to the “center” of town and the neighborhood is quiet and safe. For more information on these or any other downtown Grand Rapids condo, please visit my website at GRRealEstateInfo.com or contact me any time. Click Here to preview the available Hillmount Condos for sale.